What lessons can be learnt from the accession to the World Trade Organization (WTO) of Russia, China, and Ukraine? Were there any peculiarities in the adaptation of their economies to the rules and norms of the organisation, and what impact did it have on the world trade system? 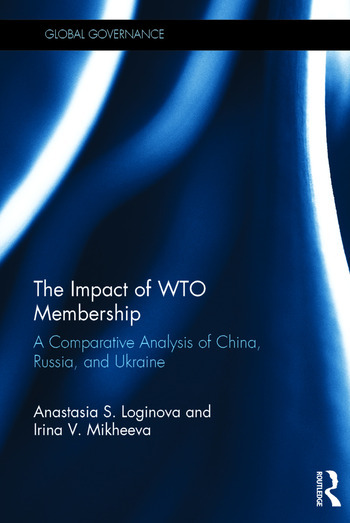 This detailed, systematic, and comparative analysis of the social and economic impact of the accession of these countries to the WTO addresses these questions, presenting an economic and legal analysis of the reasons and consequences of their joining the WTO. Comparative legal and economic methods are used to explore the social and economic causes and consequences of membership for post-communist states and to suggest ways in which new members can adapt to WTO standards. This work will be of interest to experts and students in the fields of economics, jurisprudence, and customs affairs. Anastasia S. Loginova, National Research University Higher School of Economics. Candidate of Legal Sciences (equivalent to Ph.D.), Master of Economics in International Economics, Associate Professor of the Department of Constitutional and Administrative Law of Russia. Currently she has more than forty scientific publications to her name. Her scientific research areas include foreign economic activity, customs, and law. Irina V. Mikheeva, National Research University Higher School of Economics. Doctor of Law, D.Sc., Professor, Head of the Department of Constitutional and Administrative Law. Member of the International Association for Court Administration (IACA). Dr. Mikheeva is a specialist in the fields of administrative law and the history of state and law, and is the author of over 130 scientific publications. Her sphere of scientific interests includes issues of the legal maintenance of regional economies, and the theory and history of lawmaking.